Why didn’t somebody tell me the Windows Calculator, found under Start->Accessories, has a “Scientific” mode, found under View->Scientific??? This is like waking up one morning and noticing there’s another room in your house that you just didn’t know was there before. This functionality is fairly frakin’ sweet. It’s got Hexadecimal, Octal, and Binary modes, Logarithms and Boolean Algebra functions. All sorts of stuff I’ll have very little use for, except for fun and games, but this could have enhanced some of my previous blog posts, like Why Base-10? Here I’ve been lamenting the lack of a decent scientific calculator in Windows for years, when it’s been sitting right there in front of me. I can even plug in operations so complex it hangs up the system. Now what we need is a decent, built-in graphing calculator to really have some fun. 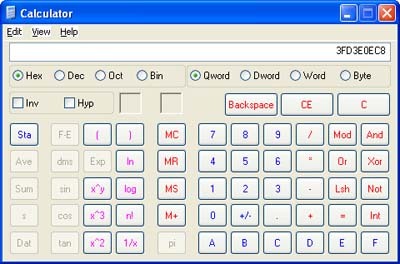 In the meantime, I’ll keep playing with Graph Calc, e-tutor’s calculator, and work on rolling my own calculator in PHP. Note: Making this change did set off McAfee Virus Scan, which “Detected an unauthorized change” to a windows program. I authorized it, but have no clue why changing a view would set off a system change alert. I love how wordpress makes my posts look like spam. I’ve been using the scientific view for about as long as I’ve been using windows. Sgant: Over 90% of the world.